Despite the obvious disadvantages, there are a number of modern sports cars which still use wooden components for that retro feel. Most of Morgan’s model range for example. 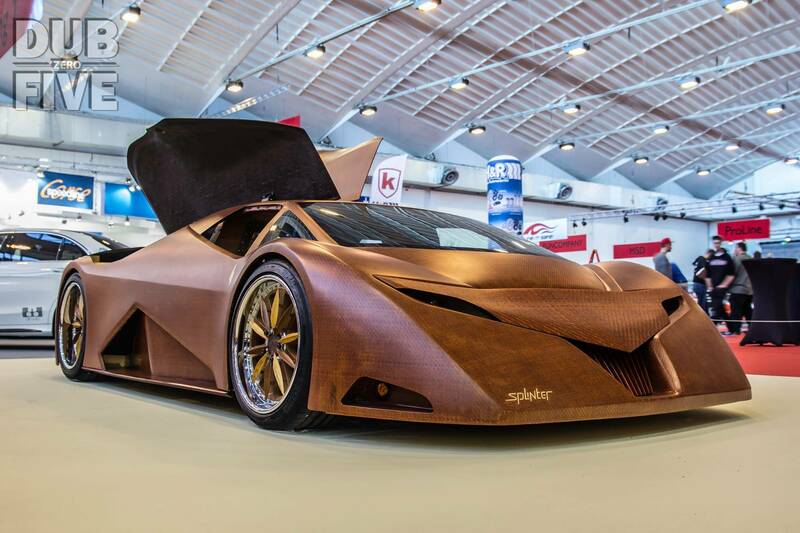 Today at Essen Motor Show 2015 a wooden supercar went on display; the Splinter! This one-off supercar was designed as a show piece by a team led by Joe Harmon, an industrial designer from North Carolina. The idea first came about as a result of a university project with a fair amount of inspiration from the World War II-era de Havilland Mosquito airplane (another all-wood design). The bodywork uses a mixture of bent and laminated wood veneers including woven cherry skins and tessellated end-grain balsa core. The chassis is a laminated veneer monocoque fitted with unequal-length upper and lower laminated wood A-arms with height-adjustable air-bag springs and adjustable shocks. The engine is a monster, mid-engined aluminium 7.0 litre V8 unit packing 600hp. It uses a 6-speed manual gearbox, although the performance will probably never be measured. If you want to take a look, it will be on display at Essen until the end of the show!